Happy Friday everybody. It’s time for Fun Find Friday, where I share my favourite purchases or finds with you all. Today I’m going to share my favourite healthy podcasts to listen to. Do you listen to podcasts? It’s still a fairly new trend in th UK and we don’t have many homegrown ones, but it’s my favourite way to multi-task. I like to listen to them while walking, folding laundry or filing paperwork. It’s ear-candy, and makes my menial jobs interesting. I have friends who listen while exercising, but I need music for that, and one who listens to them while falling asleep, but I’d get too interested and probably wake up more!! Some of the podcasts listed are for the general public, and some are aimed more at practitioners, but all are interesting and I learn so much this way. Dr Lo Radio. Dr Lauren Noel. Lauren Noel is a Naturopathic Physician in San Diego, California. Her podcast is really positive and upbeat and as well as ‘just’ health topics, she also has episodes about being your best self and how to achieve your goals and dreams. My favourite episode of her show is: All about the Adrenals, with Dr Carrie Jones. The New Frontiers in Functional Medicine. Dr Kara Fitzgerald. Kara Fitzgerald is on the faculty of the Institute for Functional Medicine, and this podcast really focuses on the hard science, the research and what is new and exciting in the field. The future of medicine. This is my favourite side of the industry for sure. Very hard to choose a favourite episode, but two of the best were: The Art of Medicine, with Sidney Baker. And, A Deeper Understanding of Fibromyalgia, with Dr David Brady. High Intensity Health. Mike Mutzel. This is slightly more of a fitness podcast, but Mike is a great interviewer and very involved in the Functional Medicine world, so there is a lot of more general health topics included on here as well. Definitely worth a trawl through the archives. My favourite episode is one related to sleep. It’s called Mouth Taping to Increase Sleep Quality and Stop Mouth Breathing. Sounds totally crazy but it’s super effective. I asked my husband to try it and it was instantly effective for him! I don’t really listen to Mind Body Green podcast all that often, but their recent interview with Melissa Hartwig co-founder of Whole30 was a brilliant one. Really honest and very inspiring. I love her straight talking ways. Positive Health Podcast with Benjamin Brown. And to wrap up, a local UK podcast from a fellow Aussie. Ben Brown ND heads up the UK chapter of Pure Encapsulations, and has many years of teaching and lecturing around the world behind him. He is known for his deep dives into the literature, the easy way he present complex information and his Aussie sense of humour. 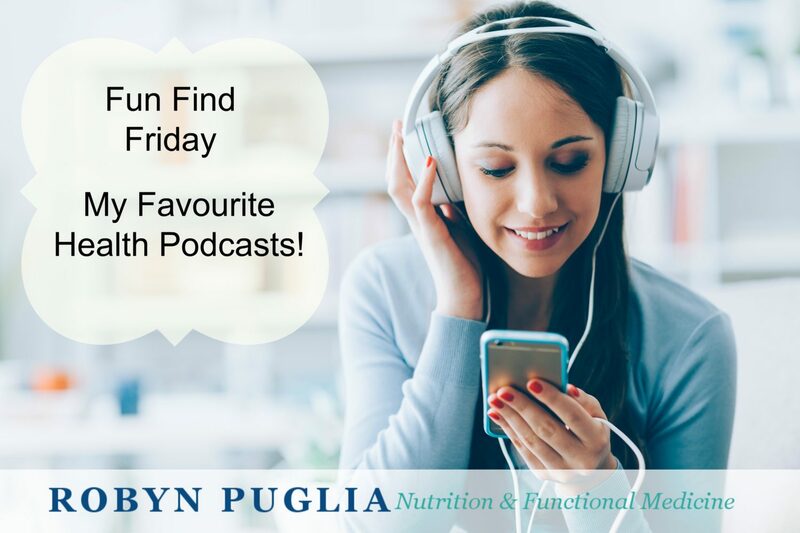 My favourite episode is definitely Phytonutrients, with Deanna Minich, who is always a fascinating speaker to listen to. But as an added bonus you can also listen to his interview with yours truly on Epstein Barr Virus and Autoimmune disease. And now over to you. What are your favourite podcasts? Or the best health-interview you’ve heard? Do comment and let me know. Have a wonderful weekend everybody. See you next Friday!